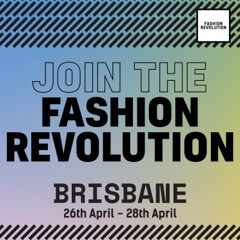 Brisbane’s very own Makers + Menders, Movers + Shakers have come together to bring you a 3 day Fashion Revolution Event! Celebrating all that is local, sustainable + creative we’d love for you to join us for a hands on + inspired experience. Throughout the 3 days we will have a range of panel discussions on how we each can REVOLUTIONISE THE FASHION SYSTEM. We’ve gathered a remarkable group of people to discuss a diverse range of topics – from how what we wear matters, diversity + inclusivity within the fashion industry, the sewing renaissance, making for positive change + living locally. An integral part of any growing movement is to have COMMUNITY INVOLVEMENT – so we’d love to hear from YOU, the audience also! There will be sewing, styling, making + mending WORKSHOPS with experienced facilitators to guide + encourage you to get hands on – what better way to appreciate the time, skill + love that goes into your garments, while also imbuing a piece of yourself into them. We’ve curated TWELVE DESIGNERS who make locally with sustainability + ethics at the core of their creative business. Come Meet the Makers while they showcase their wares on the Friday night + Saturday. Connect with their stories, ask questions + learn more about what goes into designing + making a garment from scratch. On the Sunday we’re flipping our market space! This one’s for all the VINTAGE LOVERS + those devoted to PRE-LOVED Clothing. Come find a piece utterly unique + new to you! Expect some extra little surprises throughout the venue to INSPIRE + INFORM. Heart Heart Events will provide a luscious grazing table on opening night featuring plant-based and local produce. We’ll have locally brewed Beer + a Wine Bar for you to responsibly wet your whistle! As well as non-alcoholic options available. There will be fine food options throughout the weekend – with more details to come. We can’t tell you enough how truly excited we are about our planned Fashion Revolution Event right here in Brisbane. The count down is officially on! We have so much to share with you leading up to Fashion Revolution Week. This event is a collaborative effort brought to you by a very passionate group of people who truly believe we can + will create positive change – all while having fun, expressing ourselves + connecting with those around us. JOIN US, JOIN THE FASHION REVOLUTION.